Oceanhouse Media continues to add to their Berenstain Bears omBook collection with The Berenstain Bears’ Really Big Pet Show! Just like Oceanhouse Media’s other omBooks, the interactive pages, great narration, highlighted words, and sound effects make this app another fun omBook to add to your digital collection! 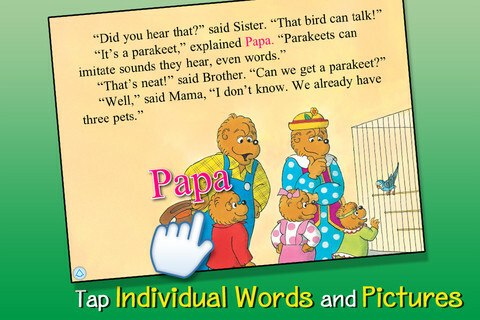 I really like the Jan & Stan Berenstain’s Berenstain Bears series as they can result in a good conversation with your children. In The Berenstain Bears’ Really Big Pet Show, the Bear Town Festival has a pet show. The Bear family get all their pets Little Lady, Grace, Swish, and their brand new bird, Keats all glamoured up for their big day in town. Dogs, cats, bunnies, hamsters, birds, fish, and even a skunk are entered into the show. Read the ebook to find out who Mayor Honeypot decides who will win prize ribbons. Besides the cute story, this omBook can also be a great discussion about how to take care of animals, and how they need lots of loving care. The Bear family loves their pets and they take very good care of them. When the Bear Town Festival hosts a pet show, the Bear family makes sure their pets – Little Lady, Grace, Swish and their new bird, Keats – look and feel their best for the big day. Dogs, cats, birds, hamsters, bunnies, snakes and even skunks are all entered in the show. With such a diverse group, who will receive prize ribbons from Mayor Honeypot?